Women of today are bustling individuals who take life by the horns. We are always ready for what life has to throw at us, so we prefer to travel with our beauty and cosmetic products with us in case anything pops up later (a surprise meeting with a client or a date) we are ready for anything. But always being on-the-go means we have little time for ourselves. We want to look good, but our schedules are too packed to practice self-care every day. Some of the products we lug around in our bags though are bulky, and our backs are tired from the extra baggage. But whenever we visit the travel-size section of any pharmacy, the toiletries available are usually formulated with long recipes of unhealthy ingredients we want nowhere near our bodies. Therefore, we were so excited to meet Bad, Baby: a hairline which features healthy aerosol products packaged within the convenient size of a pen. (Yes, a pen.) 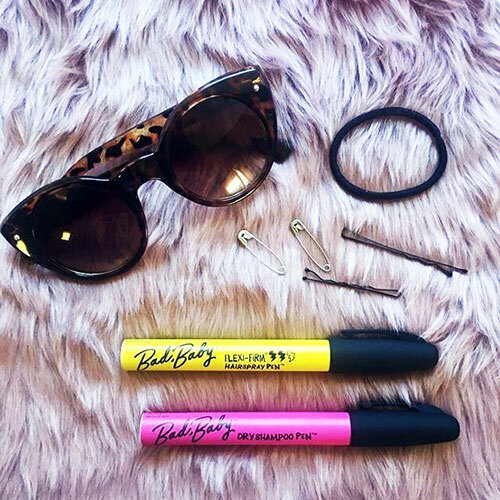 They can fit into your clutch and are perfect for on-the-go touch ups. In fact, you can fit seven Bad, Baby pens in place of one traditional travel size can. 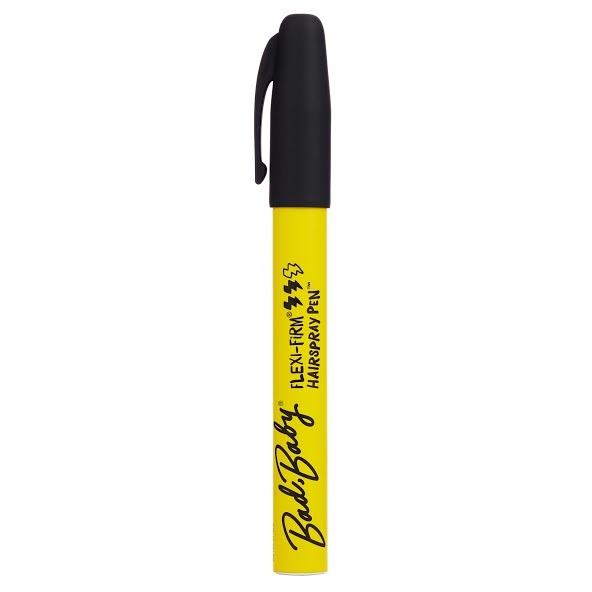 This brand uses “Aerosmall Aerosol Technology” which is the world’s first pen sized aerosol. More than 200 doses are available per spray so that they won’t run out on you anytime soon. Bad, Baby doesn’t just temporarily fix issues though but works to protect and nourish your hair as well. Their products contain no sulfates, phthalates, and parabens -meaning no harsh chemicals. Their multitasking formulas provide a Nutriblast complex which includes natural milk thistle oil, and apricot extract- ingredients that promote healthy hair. Some of our team at MyTopFace have sensitive scalps, so we relieved to hear this. So far, this brand gets an A+ for its badass packaging, innovative technology, and gentle formulas but does it work? Let’s find out. Our experts at MyTopFace first tested the Bad, Baby Dry Shampoo Pen. Dry shampoo is usually found in a spray or powder applicator. (MyTopFace prefers sprays though since they are faster to use and easier to control.) A good dry shampoo removes excess oil from your hair by absorbing the residue from your scalp. It should leave you feeling like you just washed your hair without water and a clean feeling throughout. But it’s been challenging finding a dry shampoo that does this without leaving visible powder residue in our hair. We want to wear the product discreetly, not display it to the entire world! So to get a fair assessment of the product, we waited at least two days after washing to make sure there was oil in our hair to remove. We sprayed the pen 6-8 inches away from the desired area and allowed it to dry before brushing the roots. The product was not too wet, and it settled immediately. We were grateful that this dry shampoo did not leave behind that chalky residue we mentioned earlier. It worked well in soaking up the unwanted oil. Miraculously, we felt clean again. The scent was fresh but not overpowering. The fragrance did not last, however; it disappeared within the minute. We prefer neutral scents anyhow, so we were fine that it faded so quickly. MyTopFace (MTF) beauty hacks: Before using dry shampoo, divide hair into four sections to make sure an even amount of product distributes all over. Don’t forget the back crown of your head, where most residue accumulates. Also, if your hair ever feels limp or flat, apply dry shampoo to your roots, tease with a comb and voila… instant volume! Just don’t use too much or your hair will be weighed down with all the excess product. Our experts then tested the Bad, Baby Flexi-Firm Hairspray Pen. A good hairspray will hold your hairstyle firmly but not leave your hair sticky or crunchy. Since Bad, Baby Hairspray Flexi-Firm Pen is free of sulfates, phthalates, or parabens; we were hoping it would be the answer to our hair prayers. To use: we styled our hair, made sure it was dry, then sprayed the product 6-8 inches away from our face. Since the mist is super fine, it did not create a cloud of product in our room like other hairsprays sometimes do. The fragrance was subtle and fresh. But similar to the Dry Shampoo Pen that we tested earlier, the scent also faded very quickly. We found the Bad, Baby Flexi-Firm Hairspray Pen did the job immediately and without a flake. Our hairstyle kept a firm hold the entire day but did not feel heavy at all. What we really loved though was the shine it added! This spray gets our approval. MyTopFace (MTF) beauty hacks: Use the product sparingly. In our case, just one dose was enough to work. Spray once, wait a few minutes for it to settle, then add more if needed. Also, we sprayed some product onto our bobby pins before putting them into our hair. The pins did not budge at all! The verdict? Overall, our experience with Bad, Baby was very positive. We would recommend Bad, Baby products to any type and texture of hair (thin, thick, straight, curly.) Their formulas are gently crafted yet definitely work. Their scents fade quickly, so your hair won’t be perfume overload. We also loved that no remaining residue was left behind on our hands because of their aerosol packaging which saves us time getting ready for the world. We appreciate that Bad, Baby empowers working women by its convenient packaging. We can travel around with their products which help enable our busy lifestyles. This brand understands that we do care about how we look and about taking care of our hair; we simply don’t have the time to stand in front of a mirror and redo it every morning. We are happy to add Bad, Baby to our list of favorite hairlines.